Trump Holds Campaign Rally In Florida, After Turbulent Week : The Two-Way A month into his presidency, President Trump sounded like candidate Trump at a boisterous rally in Melbourne, Fla.
President Trump pumps his fist to supporters at the conclusion of a campaign rally Saturday in Melbourne, Fla.
A month into his term, President Donald Trump hit the trail Saturday for what a White House spokeswoman called a "campaign rally for America." At Orlando Melbourne International Airport in Florida, Trump addressed a hangar packed with supporters in an event organized not by the White House but by Trump's own campaign committee. "I'm here because I want to be among my friends and among the people," Trump told the enthusiastic crowd before running through a long list of campaign promises and what he said were his administration's early accomplishments. "Jobs are already starting to pour back in," Trump told the cheering crowd. On Obamacare, he promised a plan to repeal and replace it in "a few weeks." Of the U.S.' participation in the controversial Trans-Pacific Partnership, he said, "just terminated." Talk of Air Force One cost-saving? Check. Reviving the Keystone pipeline? Check. Criticizing violence in America's inner cities? Check. Singling out Chicago for its rising murder rate, Trump declared that "safety is a civil right, and we will fight to make America totally safe again." On his executive order temporarily banning travel from seven majority-Muslim countries that was put on hold by the Ninth Circuit Court of Appeals, Trump promised "we never give up" and that "we will do something next week. I think you'll be impressed." In one of his biggest applause lines, the president talked of doing what it takes "to keep radical Islamic terrorists the hell out of our country." The Florida rally stood in stark contrast to the difficult week Trump had in Washington. On Monday, he fired his national security advisor, Michael Flynn, after reports that Flynn had discussed sanctions with Russia's ambassador before Trump's inauguration. On Wednesday, Trump's choice to lead the Department of Labor, fast food executive Andrew Puzder, withdrew his name from consideration after it became clear he lacked the support to survive a Senate confirmation vote. 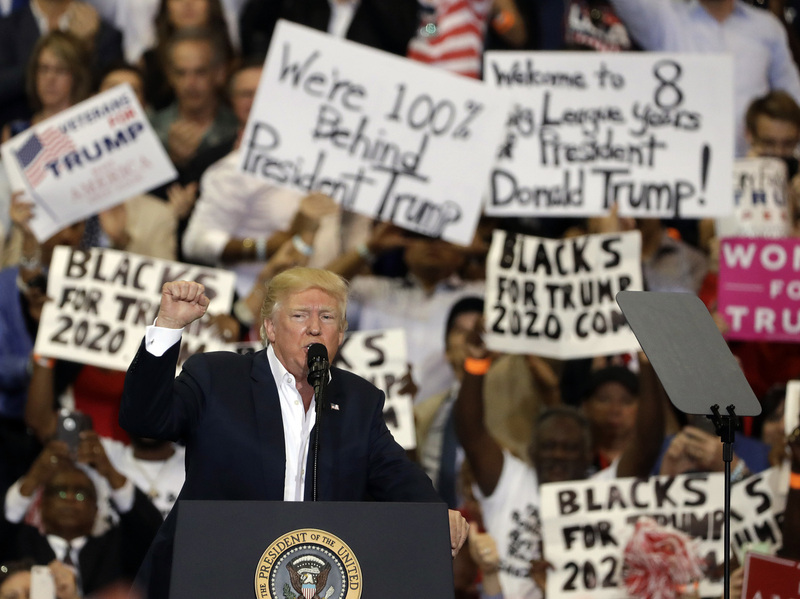 While the rally may have seemed like an attempt at a fresh start, "I wouldn't call it a reset," White House Chief of Staff Reince Priebus told The Washington Post on Saturday, "because we're quite proud of a lot of the achievements over the past four weeks." So, not a reset — but a rousing stump speech meant to take his message directly to the people. Supporter James Evert, who turned out for the rally, also saw it as a chance for Trump's supporters to give the President a boost. "Living in Washington and dealing with all the bureaucracy and all the media and a lot of the bias," Evert told NPR, "you know you probably get berated by all the negativity. And then you come to one of these things, and it's probably a refreshing moment [for Trump]. He says, 'Okay, these are the grassroots people. These are hardworking Americans, and they're here to see me and root me on and encourage me and kind of revive my momentum.' "
A smaller group protesting Trump gathered across the road from the hangar, waving signs and chanting. Trump began the rally by continuing his attacks on the media, telling the crowd he wanted to speak "without the filter of the fake news. The dishonest media which has published one false story after another, with no sources — even though they pretend they have them — they make them up in many cases. They just don't want to report the truth." Trump has stepped up his criticism of the media in the past week. On Thursday, he repeatedly berated reporters and decried their coverage as "fake news" in a contentious, 77-minute news conference. He then tweeted Friday that "The FAKE NEWS media (failing @nytimes, @NBCNews, @ABC, @CBS, @CNN) is not my enemy, it is the enemy of the American People!" Trump's suspicion of and animosity toward the press clearly resonated with many in the crowd, including Jim Sava. "The news media has this concept that they can take Donald Trump down," Sava said. "There's nothing they can do to take him down. There's nothing. The only person that could take Donald Trump down is Donald Trump. If he does not do what he said he was gonna do, that would be what has to happen to lose support from the people. The people are fed up and we just want America to be great again."